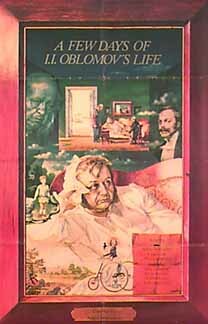 St. Petersburg, mid 19th century: the indolent, middle-aged Oblomov lives in a flat with his older servant, Zakhar. He sleeps much of the day, dreaming of his childhood on his parents' estate. 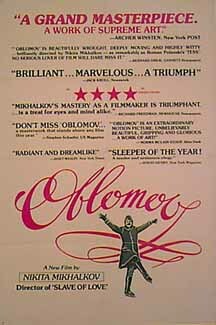 His boyhood companion, Stoltz, now an energetic and successful businessman, adds Oblomov to his circle whenever he's in the city, and Oblomov's life changes when Stoltz introduces him to Olga, lovely and cultured. When Stoltz leaves for several months, Oblomov takes a country house near Olga's, and she determines to change him: to turn him into a man of society, action, and culture. Soon, Olga and Oblomov are in love, but where, in the triangle, does that leave Stoltz? a little too long It only has one part that is really funny. It is a good story, but I think that it is just a little too long. The color is not too good. The actress which acts as Oblomov's girlfriend is very good. She expressed her feelings well. she laughed, she cried, those are very authentic.